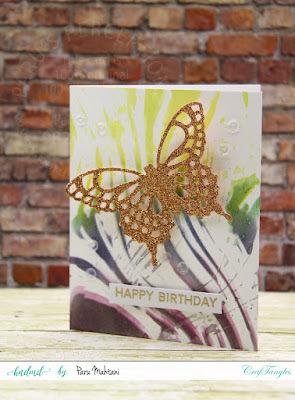 I have a few cards for you today, which I made using Craftangles stencils! I will explain my process in this post. 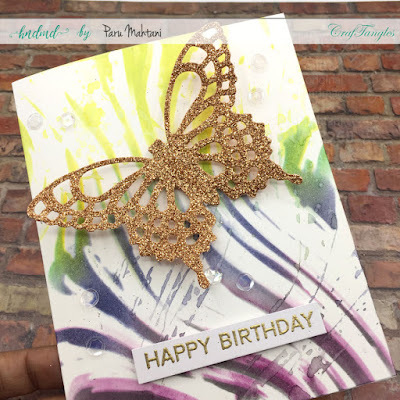 For the first card, I used the Craftangles 'Marble Effect' stencil and created this beautiful multicoloured effect using Tim Holtz 'seedless preserves', 'black soot', 'chipped sapphire' , 'mowed lawn' and 'twisted citron' distress inks. I then die cut the butter fly from DCWV Glitter Mat Stack paper pack and adhered it to the base using double sided foam tape. I gold embossed the sentiment form My Favourite things and adhered that too using double sided foam tape. I finished the card using Craftangles clear sequins. It shard to photograph the glitter paper..here is another angle. I spritzed some water on the remaining ink on the stencil and dabbed it on the card base to create some interest. This is an easy way to make the background a little interesting. which I cut down to fit on my card base. I then used Tim Holtz 'Black Soot' distress ink and Craftangles 'Stoned Wall' stencil to create the background. 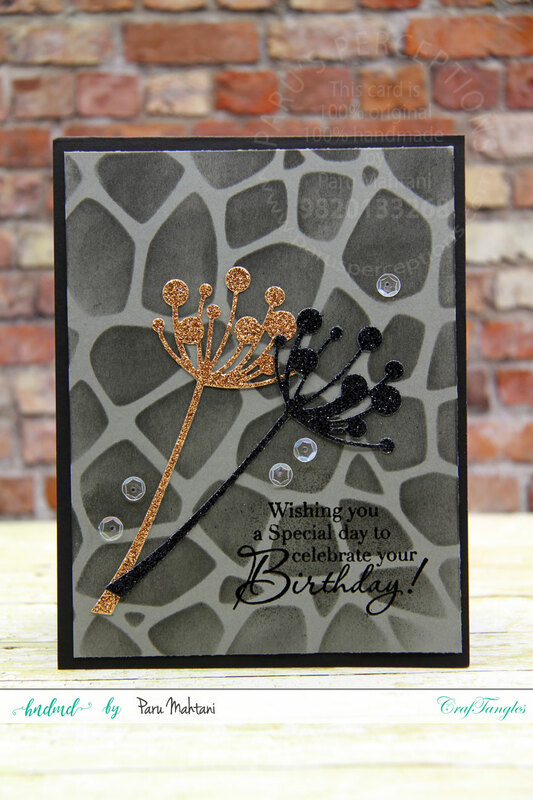 I then used the black and pink gold glitter sheets (from DCWV) to die cut the Memory Box Dandelion, which I adhered to the card base. I added a heat embossed sentiment from Stampendous, and some Craftangles clear sequins to finish the card. 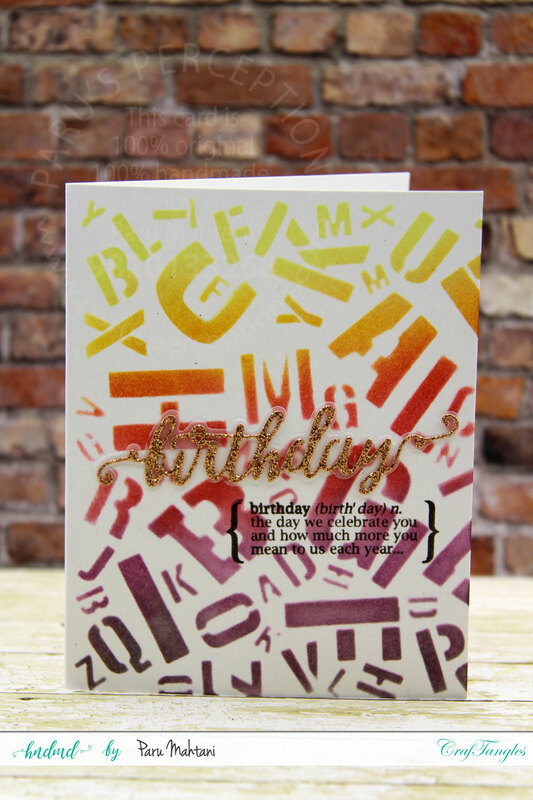 For the next card, I used the Craftangles 'Jumbled alphabets' stencil along with Tim Holtz 'seedless preserves' , 'fired brick, 'carved pumpkin' and 'twisted citron' distress inks. I then die cut the birthday (Craftangles birthday wishes) from scraps of the glitter paper, I used for the cards above, adhered it to the card base and finished the card with a stamped sentiment from stampendous. For the last card, I started with a kraft card base, from Craftangles. 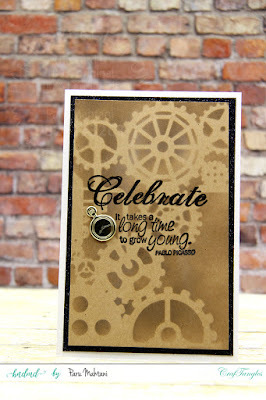 I used Memento Rich cocoa ink along with Craftangles 'Gears' stencil. 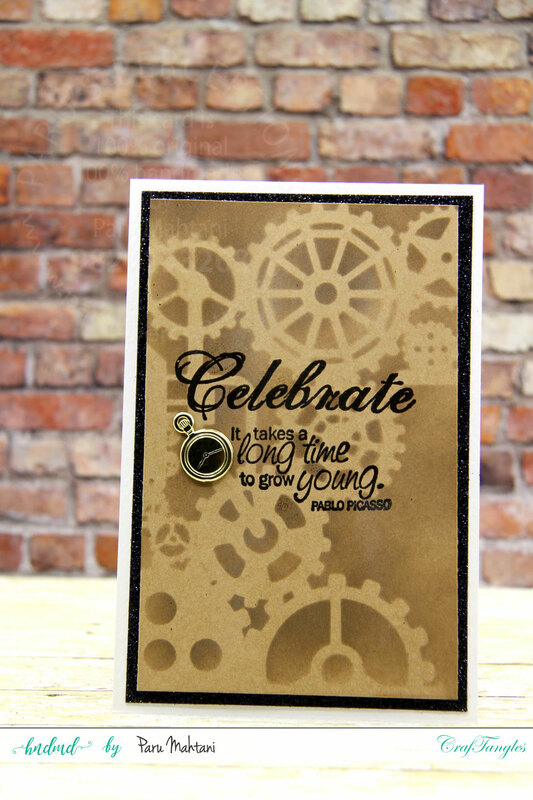 I stamped and embossed a simple sentiment form Paper Wishes and added a clock brad from Recollections. I then matted this panel on a black glitter card base, cut to size. I adhered this to a white card base to finish the card. The Craftangles range of stencils are super fun and super fun, and, I hope you will give them a try!